Aiko Valentine sent this photo to me a few days ago. Her sister has purchased this parasol from a store called Earthbound Trading Company. Despite the incorrectly written characters, 伊勢 or 伊勢囯 is a province in Japan. 戦国 or 戦国時代 is referring to Japan’s Warring State Period which is roughly from mid 15th to early 17th century. 戦国村 could either be a village or a compound from the Warring State Period. 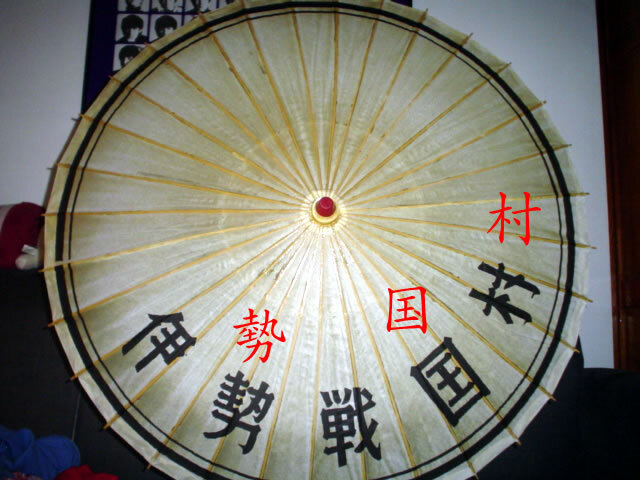 For those who are not familiar with Japanese history or read the five characters on the parasol as Chinese, 伊勢戦国村 might mean something like “Iraqi/Iranian warring/conflicting village”. The reason why it might mean either “Iraqi” or “Iranian” is because both terms were phonetically translated into Chinese and often abbreviated using just the first character. 伊拉克 is “Iraq” and 伊朗 for “Iran”. 伊勢戦国村 is the former name of a theme park in 伊勢市 (Ise City) Japan. The park is now called 伊勢・安土桃山文化村 (Ise Ando Momoyama Bunka Mura). The theme park is laid out in the form of a town featuring a prominent castle and other features of Japan during its 戦国時代, hence the name. The umbrella may have actually been one from the park that was disposed of when they changed the name and no longer needed items bearing the old name. This form of the character 勢 could be a somewhat unusual abbreviated Japanese form, but I am not sure. It is interesting that the name of the theme park can be read in Chinese as having something to do with war in Iran or Iraq, but that is probably just a coincidence. The park is now called 伊勢・安土桃山文化村 (Ise Ando Momoyama Bunka Mura). This 安土桃山 comes from 安土桃山時代 which is a different period of Japanese history from 戦国時代, so presumably they changed the name of the theme park for some reason having to do with historical accuracy. I agree that the umbrella probably comes from the theme park in Japan. I think the "incorrectly written" characters are probably just stylized, rather than mistaken. I imagine they were mass-produced as a souvenir for purchase at the park. Besides, would they really print 国 as having 王 inside instead of 玉? would they really print 国 as having 王 inside instead of 玉? I looked into this and found that a Japanese 漢和辞典 lists this form (having 王 instead of 玉 inside 囗) as being a nonstandard variation (俗字) of 国.
Paraphrased, the author is saying that abbreviated forms of the character 國 containing either 王 or 玉 insice 囗 have been used since ancient times, and the 王 variation appears to have been the more common variant. In fact, even in China, the name of the country 太平天国 as it appeared on their coins used the 王 variant. Prewar Japanese character lists also used the 王 variant for 國. The author is somewhat perplexed as to why the 玉 variant ended up being adopted as the standard abbreviated character on the 1949 list of Toyo Kanji. The author speculates that perhaps the use of the 王 variant could be considered to be supportive of the king (emperor) and have been inappropriate for postwar Japan. Similarly, in Mainland China, when proposing abbreviated forms of characters, they had intentionally avoided the 王 variant as being incompatible with Communist ideology. You will see that there is no "dot," so the character inside 囗 is 王 not 玉. Again, no dot in 国. The Taiping official seal used jade instead of king, though, so while it may have been a variant, I'm still not convinced. The park doesn't appear to have an email address, but there must be some way of contacting them to settle this. Period theme parks like that are pretty common in Japan, and at least some of them do sell souvenir umbrellas. My wife had one from Something Edo Mura years ago. But it had nicely-written characters on it. The kanji in the picture look like they were written by Japanese 5th graders. I can't believe that any theme park would sell souvenirs with such miserable-looking kanji. I can't imagine any Japanese person buying one. I think this is probably a copy of a real umbrella, produced and sold outside Japan. Alan, what this meant was: in 天國, 囯」replaces「國. For the significance of having a king (王) residing within the country/kingdom. I find it very interesting that the author felt it necessary to give an explanation of the character 囯. This tells me that many Chinese people may not be familiar with the character. It certainly seems to be an unusual character. The English name of this park (that was all over the signage) was "Edo Wonderland." Hi Alan, I did a bit of googling and found the answer. Apparently 囯 is an alternate character for 國 used by Hong Xiuquan, leader of the Taiping Rebellion. "In its first year, the Heavenly Kingdom minted coins that were 23 mm to 26 mm in diameter, weighing around 4.1 g. The inscription 太平天囯 ("The Heavenly Kingdom of Great Peace") was on the front and 聖寶 ("Holy Treasure") on the back. Unlike the canonical character 國 for "country" used at that time, the Kingdom chose alternative variant form 囯 instead, which is a king inside a boundary. It somewhat resembles the simplified character 国 that was created by the PRC government."